The Ga4Ne group is always looking for reasons to reach out to all of the Nebraska Alumni, fans, and their families. Drop us a line, and we will get back to you as soon as possible. Congratulations to Justin M. for his acceptance into UNL! Justin is currently a Georgian resident finishing up high school and has been part of the Georgians for Nebraska organization for many years. He is interested in pursuing a business degree while attending the university. There is no doubt that he will enjoy his time at Nebraska and we wish him the best in all of his endeavors! Georgians for Nebraska is a 501c(3) not-for-profit organization. All proceeds we make go (from any business activity, event, raffle, etc) goes to the Georgians for Nebraska scholarship fund. We also provide opportunities to donate/participate with various non-profit organizations as well. Based in Metro Atlanta, Georgians for Nebraska (GA4NE) is a collection of volunteers working to support awareness of the University of Nebraska. The chapter’s signature programming event, watch site football parties, are held during college football season where hundreds of Husker fans meet to cheer on the Nebraska football program. As a not-for-profit, volunteer-ran organization, GA4NE endeavors to generate funds to support the chapter’s leadership role in sending Georgia high school students to the University of Nebraska-Lincoln. 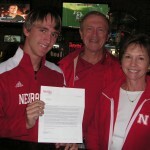 Each year a scholarship donation is made on behalf of GA4NE to the University of Nebraska Foundation. Donations can be made by contacting GA4NE. Our membership includes University of Nebraska alumni, fans of Husker athletics and/or former Nebraska residents living in or near the state of Georgia. GA4NE will build a stronger alumni association and greater university by keeping alumni, students and friends informed and involved through leadership, programming, communication and membership. Operates as a not-for-profit organization. Membership dues, donations and fees for special events go towards operating costs of the club. All extra proceeds are donated to a scholarship fund set up with the University of Nebraska Foundation. Highly educated membership – families, young and old attend watch sites. Attendance at the watch site for locally televised games averages 100-200. Attendance at the watch site for non-locally televised games averages 200-300.